The publicly traded office-supply chain is trying to shift from its retail roots, and the sale to investment firm Sycamore Partners will put that process out of the public spotlight. Staples will be acquired by Sycamore Partners for about $6.9 billion in one of the largest retail deals of the year, a wager that the office-supply chain is better off continuing its turnaround plan as a private company. 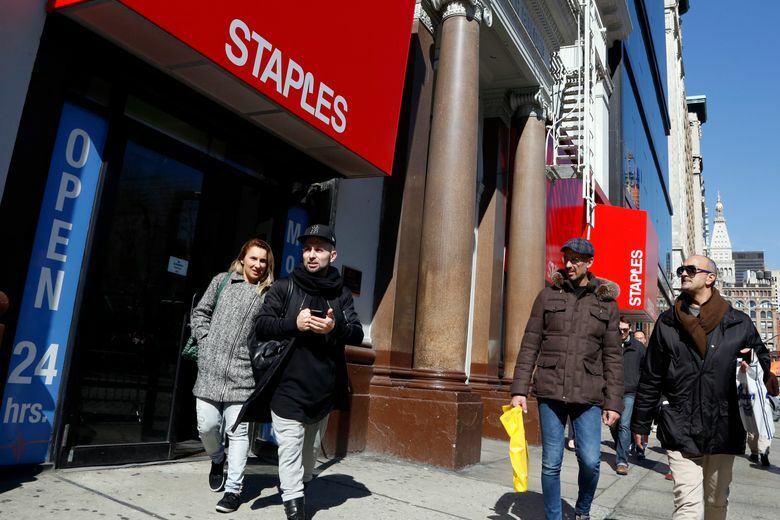 Sycamore, saying it was attracted to Staples’ “iconic brand,” is paying $10.25 a share for the retailer, according to a statement Wednesday. That represents a 12 percent premium to its share price Tuesday, before reports surfaced that the transaction was close to be being completed. The deal gets Staples out of Wall Street’s limelight and lets it focus on a turnaround plan that includes reducing its retail footprint. But it’s hard to tell how the buyout will fix its fundamental challenges, including the rapid shift of customers to Amazon.com and slackening demand for traditional office supplies. “This doesn’t change the industry dynamics or the pressures the retailer faces,” said Seema Shah, an analyst at Bloomberg Intelligence. The deal caps more than a year of turmoil for Staples, which was thwarted in an attempt to make its own acquisition in May 2016. The company had tried to purchase Office Depot in a $6.3 billion deal that would have unified the two largest office-supply sellers, but the transaction was opposed by antitrust regulators. After its bid for Office Depot failed, Staples Chief Executive Officer Ron Sargent stepped down and the company scrambled for a Plan B. Under new CEO Shira Goodman, Staples closed stores and sought to recast itself as a source of business services. Last month, it overhauled its marketing to pivot away from its roots — selling low-priced office supplies at big stores. Its new TV ads don’t show stores, instead focusing on office managers at work. But sales continued to decline at the company, which began discussing buyout possibilities with private equity firms. The first Staples store was opened by former supermarket executive Tom Stemberg in Brighton, Massachusetts, in 1986. According to company lore, he was inspired to start the retailer because his typewriter ribbon broke over the Fourth of July weekend and he couldn’t find a replacement. The company, now based in Framingham, Massachusetts, expanded quickly in the 1990s and early 2000s using a tagline “That was easy.” But the digital revolution took a toll on the chain. E-commerce sales hurt brick-and-mortar demand, and many businesses are using less paper, ink and other supplies. In May, Staples reported that first-quarter sales dropped 4.9 percent from the previous year to $4.1 billion. It shuttered 18 stores in North America during that period, leaving it with 1,237 locations in the United States and 304 in Canada. Sycamore, founded by Stefan Kaluzny and Peter Morrow, raised $2.5 billion for its second fund in 2014. The Staples acquisition would be the biggest deal to date for the firm. It previously acquired department-store chain Belk for $2.7 billion. The Staples acquisition is slated to close by the end of 2017. The debt brings new potential challenges, Shah said. “The risk is, of course, that sales and margins continue to be under pressure and that the retailer struggles to service its debt,” she said. Staples shares jumped 8.4 percent to $9.93 after The Wall Street Journal reported on Wednesday that the Sycamore takeover was imminent. The stock was up 1.2 percent this year through Tuesday’s close. Sycamore is known for seeking retail brands and trying to turn them around. But Staples has been striving to shed its retail image. By 2020, the company expects to get only 20 percent of revenue from retail locations, down from about 40 percent now. The rest will be generated by delivery and online sales. “The Sycamore Partners’ team shares Staples’ entrepreneurial spirit and long-term vision,” Goodman said in the statement.